The Van Halen family immigrates to the United States with only a piano and 75 guilders (about 50 U.S. dollars). The family settles in Pasadena, Calif., and the kids—Edward (Eddie) and older brother Alex—soon start piano lessons. Eddie, 12, purchases his first electric guitar, a Teisco Del Ray, for $110 at Sears. He practices incessantly, heavily influenced by Eric Clapton's playing in Cream. He attends McKinley Elementary School. Eddie fronts a trio called Mammoth with Alex on drums and high school friend Mark Stone on bass. Eddie is also singing lead. Mammoth rents its PA system from David Lee Roth, who charges the band $50 a night for it. Roth is in the band within a year. Van Halen, one of the most successful debut albums ever, is released. The album features “Runnin' With the Devil,” “Jamie's Cryin'” and Kinks cover “You Really Got Me.” It also contains Eddie's mind-blowing solo warm-up exercise, “Eruption,” recorded at Ted Templeman's suggestion. Much of the album's guitar work is done on “Frankenstein,” then in its original black-and-white striped incarnation, as pictured on the album cover. Eddie's recording studio, 5150 Studios (named for the California police code for the criminally insane), is finished in Studio City, Calif. All subsequent Van Halen albums are recorded there. “Jump” lands at No. 11 on VH1's 100 Best Songs of the Past 25 Years. David Lee Roth leaves the band, to be replaced by singer/guitarist Sammy Hagar. The video for “Right Now” wins three MTV Video Music Awards (Best Direction, Best Editing and Video of the Year). Eddie and Alex shoot a "Got Milk?" advertisement at 5150, marking the first time that members of a rock and roll band appear in the famous ad campaign. Eddie confirms that he has been battling cancer. The band joins Sammy Hagar for a tour and releases compilation album The Best of Both Worlds. Van Halen is inducted into the Rock and Roll Hall of Fame. Robert Downey Jr. presents Eddie with the first-ever “Rock God Award” at the 3rd Annual Spike TV Guy’s Choice Awards in Culver City, Calif.
A Different Kind of Truth is released, marking Van Halen’s first studio release since 1998 and the first with David Lee Roth on lead vocals since 1984. The album debuted at No. 2 on the Billboard 200 albums chart. On Jan. 26, Edward Lodewijk Van Halen is born to Jan and Eugina Van Halen in Nijmegen, Netherlands. Eddie attends John Marshall Jr. High in Pasadena, Calif.
Eddie graduates from Pasadena High School in Pasadena, Calif.
Eddie attends Pasadena City College in Pasadena, Calif. Mammoth rents its PA system from David Lee Roth, who charges the band $50 a night for it; Roth is in the band within a year. Michael Anthony replaces Mark Stone. Meanwhile, Eddie has been working on building his own guitar. At Roth's suggestion, the band's name is changed to Van Halen, and they play regularly at Gazzarri's in West Hollywood. Kiss bassist Gene Simmons sees Van Halen perform at an L.A. club and flies the band to New York to record demos, but Eddie is unsatisfied with the work and nothing comes of the relationship. Mo Ostin and Ted Templeman of Warner Bros. Records see Van Halen at the Starwood in Hollywood and offer them a contract within a week. The band records its first album, Van Halen, in 18 days at Sunset Sound Recorders. Van Halen, one of the most successful debut albums ever, is released. The album features “Runnin’ With the Devil,” “Jamie's Cryin’” and Kinks cover “You Really Got Me.” It also contains Eddie’s mind-blowing solo warm-up exercise, “Eruption,” recorded at Ted Templeman’s suggestion. Much of the album’s guitar work is done on “Frankenstein,” then in its original black-and-white striped incarnation, as pictured on the album cover. Van Halen kicks off its first world tour with a show at the Aragon Ballroom in Chicago, as the opening act for Journey and Montrose. Van Halen's debut album sells 500,000 copies and is certified gold. Van Halen's debut album sells 1,000,000 copies and is certified platinum. Van Halen II is released, featuring the hit “Dance the Night Away.” The band begins its first headlining tour. Eddie Van Halen is still using “Frankenstein,” but it has received a new red, black and white paint job, and an unusual new locking tremolo system by Seattle designer Floyd Rose. Van Halen II sells 500,000 copies and is certified gold. Van Halen II sells 1,000,000 copies and is certified platinum. Women and Children First is released. Women and Children First is certified platinum. 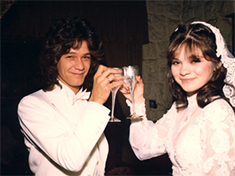 Eddie proposes to actress Valerie Bertinelli. The couple had first met backstage at a Van Halen show. Eddie weds actress Valerie Bertinelli in Westwood, Calif., at St. Paul the Apostle Church in front of 400 guests. Construction begins on Eddie's 5150 Recording Studio. Van Halen's cover of Roy Orbison's “(Oh) Pretty Woman” hits the Top 40. Van Halen's fifth studio album, Diver Down, is released and is supported by one of Van Halen's most successful tours. “(Oh) Pretty Woman” meanwhile enters the Billboard Top 10. Diver Down is certified platinum, while “Dancing In the Streets” enters the Billboard Top 40. Van Halen earns the record for highest-paid single performance by a music group—$1 million—for a 90-minute appearance at the US Festival in San Bernardino, Calif. The keyboard-inflected 1984 is released to huge success; “Jump” soon reaches No. 1 on Billboard's singles chart. 1984 sells 1,000,000 copies and is certified platinum. The single “I'll Wait” cracks the Billboard Top 40 singles chart. The single “Jump” is certified gold. The single “I'll Wait” enters the Billboard Top 10 singles chart. The single “Panama” enters the Billboard Top 40 singles chart. Debut album Van Halen is certified five-times platinum. 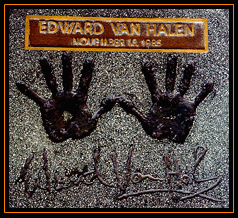 Eddie places his hands in cement as he is inducted into the Hollywood Rock Walk, located in front of Guitar Center on Sunset Blvd. in Los Angeles, Calif. The first Van Halen effort with Sammy Hagar, the smash 5150, is released and becomes the group's first album to reach No. 1 on the Billboard album chart. 5150 is nominated by the American Music Awards for Favorite Pop/Rock Album, and the band is nominated for Favorite Pop/Rock Band/Duo. Van Halen's David Lee Roth-led album 1984 is certified six-times platinum. Van Halen releases its second album with Sammy Hagar, OU812, with hits including “Finish What Ya Started” and “When it's Love.” The album reaches No. 1 on the Billboard pop music charts. OU812 is certified two-times platinum, and Van Halen headlines the Monsters of Rock tour. OU812 is certified three-times platinum. Van Halen is also nominated for three American Music Awards (Favorite Pop/Rock Band/Duo/Group, Favorite Heavy Metal/Hard Rock Artist and Favorite Heavy Metal/Hard Rock Album) for OU812. Diver Down hits the three-times platinum mark, while Van Halen is certified six-times platinum. The video for “Finish What Ya Started” earns a nomination for Best Direction at the MTV Video Music Awards. Van Halen II is certified four-times platinum. 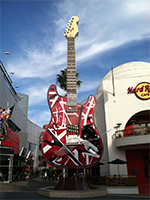 Wolfgang William Van Halen is born at St. John's Hospital in Santa Monica, Calif. Weighing 7 pounds and 6 ounces, he is named after Wolfgang Amadeus Mozart. For Unlawful Carnal Knowledge is certified platinum. For Unlawful Carnal Knowledge is certified two-times platinum. For Unlawful Carnal Knowledge wins an American Music Award for Favorite Heavy Metal/Hard Rock Album. Van Halen is also nominated for Favorite Heavy Metal/Hard Rock Artist. For Unlawful Carnal Knowledge wins big with a Grammy for Best Hard Rock Performance. Van Halen releases live LP Van Halen Live: Right Here, Right Now. Van Halen Live: Right Here, Right Now is certified platinum. Van Halen Live: Right Here, Right Now reaches two-times platinum, while Van Halen hits seven-times platinum. 1984 is certified seven-times platinum, and Van Halen is certified eight-times platinum. 5150 is certified five-times platinum, while Fair Warning goes to two-times platinum, Women and Children First reaches three-times platinum and For Unlawful Carnal Knowledge goes three-times platinum. Balance is released to major fanfare. Balance tops the Billboard pop album chart for one week. Balance is certified two-times platinum. Eddie and Alex shoot a “Got Milk?” advertisement at 5150, marking the first time that members of a rock and roll band appear in the famous ad campaign. Van Halen is nominated for an American Music Award for Favorite Heavy Metal/Hard Rock Artist. The band gets a Grammy nomination for Best Hard Rock Performance for “The Seventh Seal.” Meanwhile, Sammy Hagar leaves the band. Van Halen is certified 10-times platinum, while 1984 hits the nine-times platinum mark. Compilation The Best of Van Halen, Vol. 1 is released, featuring two new songs with David Lee Roth. Eddie and Alex's work on “Respect the Wind” is nominated for a Grammy for Best Rock Instrumental Performance. Van Halen III is released; it is the only album with singer Gary Cherone. Diver Down reaches the four-times platinum mark, and The Best of Van Halen, Vol. 1 goes two-times platinum. Van Halen III is certified gold. 1984 is certified 10-times platinum. Gary Cherone exits the band. Van Halen comes in at No. 7 on VH1's 100 Greatest Artists of Hard Rock. After 23 years, Van Halen and Warner Bros. Records part ways. Eddie announces that he has “a clean bill of health” after a battle with cancer. Rolling Stone places Van Halen at No. 415 on its list of the 500 Greatest Albums of All Time. 5150 reaches the six-times platinum mark; Van Halen II goes five-times platinum; OU812 is certified four-times platinum; and The Best of Van Halen, Vol. 1 and Balance are both three-times platinum. The band joins Sammy Hagar for a tour and releases compilation album The Best of Both Worlds. The Best of Both Worlds is certified platinum. Eddie's son Wolfgang (“Wolfie”) Van Halen replaces Michael Anthony on bass. 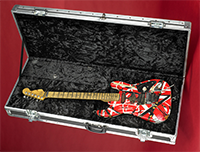 A very special 300-instrument limited-edition run of the Eddie Van Halen Frankenstein™ guitar replica is presented by Eddie and the Fender® Custom Shop. The instrument is an incredibly detailed recreation of Eddie's legendary homemade guitar. Van Halen embarks on a worldwide tour with David Lee Roth taking over vocal duties. The tour proves to be the highest grossing in the band's history. Eddie appears on the cover of Guitar World's September issue. While Eddie is away on tour, his Studio City home makes national news when a water main breaks above the property and floods the guitarist's backyard and a small portion of his home. Eddie and Valerie's divorce is finalized after 26 years of marriage. Eddie appears alongside Wolfgang on the April cover of Guitar World. This is the first cover to ever feature a father/son team. Eddie graces the cover of Rolling Stone magazine's June issue, which features the “100 Greatest Guitar Songs of All Time.” “Eruption” is ranked sixth on the list while “Panama” takes No. 47. Entertainment Weekly lists 1984 at number 72 on list of 100 Best Albums of the Last 25 years. Eddie proposes to publicist and stunt woman Janie Liszewski in Maui, Hawaii, while on vacation. The couple met in June 2006 while she was being interviewed for the position of publicist and event coordinator for the launch of an EVH project; she was hired shortly thereafter to do PR for the band during its 2007 and 2008 tours. Eddie appears alongside Tony Iommi on the cover of Guitar World's 30th Anniversary issue. Eddie appears on the cover of Guitar World's February issue. Robert Downey Jr. presents Eddie with the first-ever “Rock God Award” at the 3rd Annual Spike TV Guy's Choice Awards in Culver City Calif.
Eddie and Janie marry in the backyard of their Studio City, Calif., home in front of 100 guests. Alex Van Halen, an ordained minister, officiates. Eddie's “Frankenstein” guitar is featured in the August issue of Guitar World. The issue's feature story is “100 Greatest Classic Rock Guitar Songs.” “Eruption/You Really Got Me” comes in at number eight and “Hot For Teacher” places at No. 67. 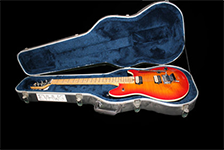 Eddie's “Frankenstein” replica (Frank 2) guitar is acquired by and displayed at the Smithsonian Institution's National Museum of American History as part of the National Treasures of American Pop Culture Collection. Eddie appears in the December issue of Rolling Stone magazine. The feature story is “100 Greatest Guitarists of All Time” and Eddie comes in eighth. From his personal collection, Eddie donates a 1999 Wolfgang Cherry Sunburst 5A Flame Top guitar to “Drop In the Bucket,” a charitable organization that provides clean water to schools and villages in Africa by building wells. 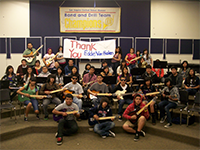 Eddie donates 75 of his personal guitars to the Mr. Holland's Opus Foundation, which distributes the gifts to various music programs in public schools throughout the Los Angeles area. A Different Kind of Truth is released, marking Van Halen's first studio release since 1998 and the first with David Lee Roth on lead vocals since 1984. The album debuted at No. 2 on the Billboard 200 albums chart. Prior to embarking on the A Different Kind of Truth tour, Van Halen holds a friends-and-family concert in L.A. on Feb. 8. 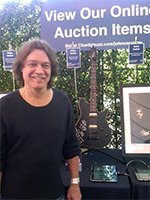 Eddie donates a Wolfgang guitar to the John Varvatos 9th Annual Stuart House Benefit. Proceeds from the guitar aid in the treatment of victims of child sexual assault. Eddie appears on the cover of Guitar World's August issue. Eddie donates a Wolfgang guitar to and attends the John Varvatos 10th Annual Stuart House Benefit. Proceeds from the guitar are used toward treating victims of child sexual assault. The Roth-fronted Van Halen plays a landmark show at the Stone Festival in Sydney, Australia. Van Halen goes to Japan to play one concert each in Tokyo and Nagoya, and two in Osaka. Eddie is featured, along with other notable subjects, on the cover of Esquire magazine's 80th Anniversary issue. Eddie appears on the December 2013 cover of Guitar Aficionado for the first time.